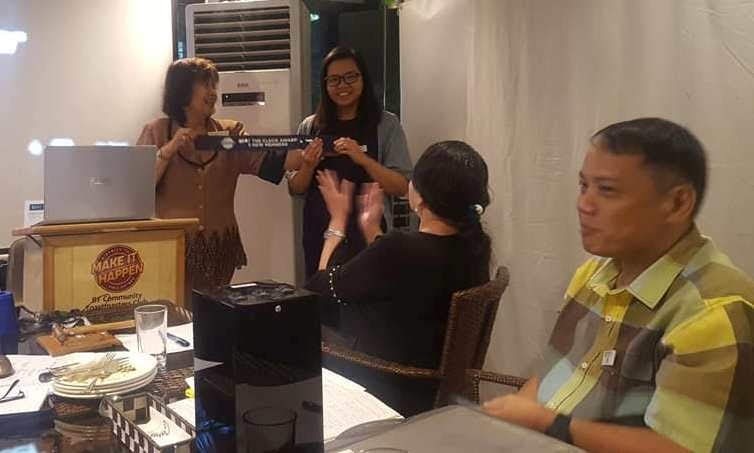 It was apparently a red-letter day as DTM Rema Manzano came to grace the club meeting and deliver ribbon awards! These were the recognition awards that the club achieved for the preceding term. Shown in the photo below are (L-R): Nath Batac, Renzo Vergel de Dios, Janice, Paul, Rey Pepino, Ed Ramirez, me, Rema Manzano, Leonzo Escolar, Marlyn Malinao, Leah Catapia, Ana, Ching Bognot and Nelle Cirujales. Other attendees who came in earlier were: Jude, Lita, Loise and Earl. This particular meeting was set at 5 pm to 7 pm and it was to give way to an all-day Leadership Symposium entitled, "Conquering Challenges", which was held at Landbank in Malate. I, however, came from a physical therapy session for my right shoulder. At Casa Medica, where I had my physical therapy, I even met a Toastmaster friend, Ian Lagutan. He was waiting outside for his mom. His mom had physical therapy sessions for her knee. With the usual heavy traffic, I didn't think most would come on time. But, to my surprise, many did! President Ching even managed to start the meeting exactly at 5 pm. Today I delivered my Evaluation & Feedback 2nd Speech for Presentation Mastery. It was only this week that I thought of the topic for this speech. Entitled, "King of the Road", the speech talks about the morning walks I do as a regular exercise routine. For the first time, I incorporated singing parts within a speech. First, I sang the well-known nursery rhyme, "Eensy Weensy Spider". The second one, at the conclusion, were the first lines of the song, "King of the Road". I sang both to illustrate the tempo of the song to dictate the cadence or pace of marching and walking. Overall, I think the speech went well. I was able to deliver the content. Although I didn't deliberately put in and practice body movement, I still saw myself naturally moving across the stage. Wow, that was a first for me. However, I missed a few lines of the song. It didn't help that the audience were not familiar with "King of the Road". So, moving forward, I either use a very familiar song, or read the lyrics so I don't forget it. I was in tune though, and that mattered to me more. 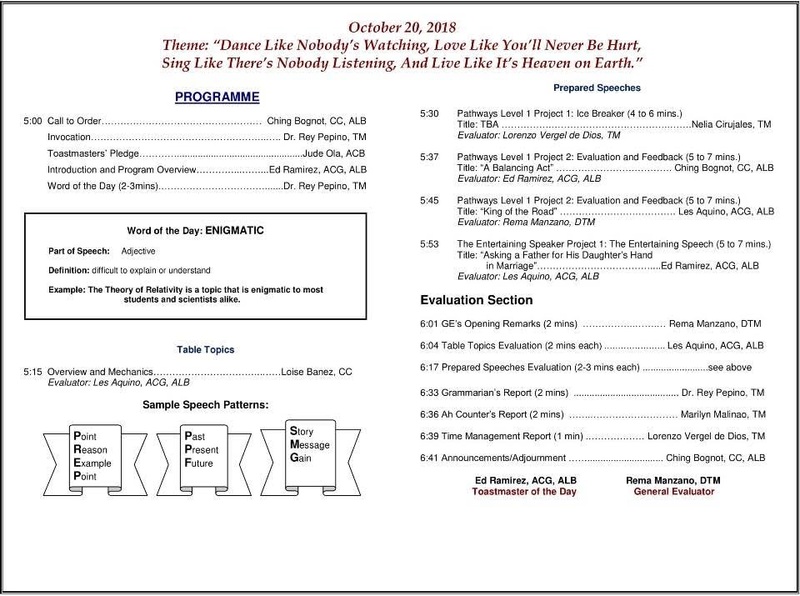 Surprisingly, my evaluator, Rema, found my singing "nice, and went well with the title of the speech". Woohoo! Alright! As the BF Community Toastmasters Club founder, Rema handed out the ribbon awards that the club was able to achieve in the previous (Leah's) term. She had the ribbons because the club uses her home address as the club's mailing address at Toastmasters International. Here's Rema handing the Beat the Clock Award ribbon to IPP Leah as current Club President Ching applauds. These are the three ribbons that the club received. The Beat the Clock Award was for the aggressive membership building campaign we had for the months May to June. 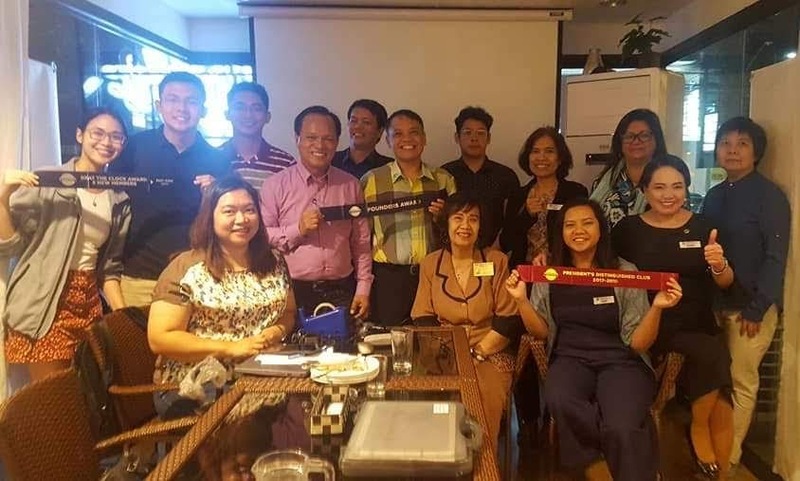 The Founders Award was for the club's sponsoring a new club to be formed, and this was the Alabang Community Toastmasters with club number 4786873. Finally, the last ribbon handed out was the President's Distinguished Club Award. This is the most coveted club award for any term. It is the highest award for club achievements (at least 9 DCP points). You'll see the ribbons proudly held up by club members in the first photo above. My mentee delivered his HOT contest piece today so he could practice it before an audience. The visuals have improved. There have been a few lapses in the delivery, but that's okay, there's still a week to practice. He also gave his Evaluator speech for his Evaluation & Feedback Level 1. This was after I prodded him to continue delivering speeches even if he was preparing for the contest. After the contest, he would be finished with Level 1. Here's a pdf copy of today's meeting program.